Raina Telgemeier, the NEW YORK TIMES bestselling author of the Eisner Award winner, SMILE, brings us her next full-color graphic novel . . . DRAMA! 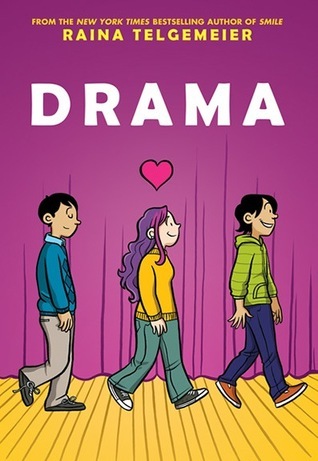 Raina Telgemeier's Smile is probably my favorite graphic novel of all time (though I think graphic memoir is a more accurate description) and as soon as I finished reading it, I was ready for her to publish a new book. It took three years, but I finally get my wish. I can't wait for September! I don't read a lot of graphic novels, but this sounds really cute. :) Thanks for sharing! Well this def sounds like a ton of... Drama (: I might have to check this one out! Happy Reading! I loved this book! It's set in middle school but reads a little older so will be good for a wide range of ages. And I love that it centers around a tween set designer!